The School of Permaculture Design at PRC offers one of the world’s most unique and comprehensive programs in Permaculture Design and Resilient Ecosystems. A 10-month program that prepares graduates to be leaders in the field of permaculture and sustainable food and medicine systems. 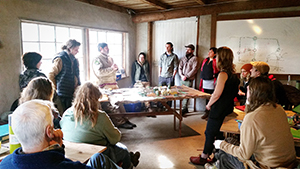 Individuals wishing to learn more about Permaculture Design and Resilient Ecosystems without enrolling in the full program are welcome to partake learning opportunities offered through our School of Continuing Education.